Thursday brought a flat tire at 9:30 p.m. Later investigation showed that the culprit was likely a couple of burrs on the edge of the rim. It was scheduled for replacement before the winter anyway, so I guess this was a good way of reminding me to make a trip to the bike shop. On Sunday afternoon, I wiped out on a pile of wet leaves while going downhill with a firm grip on the brakes. Predictably, the front wheel locked and slipped out to the side, slamming me to the ground. It’s the second time I’ve crashed in less than a year, and by far the hardest I’ve gone down in a long time. Nothing broken beyond my pride, but my arm is still smarting from the bruise and road rash. I was also reminded why I wear a helmet: not because it’ll save me if I get hit by a car, but because I come perilously close to knocking my head on the ground without any help from right hooks or door prizes. 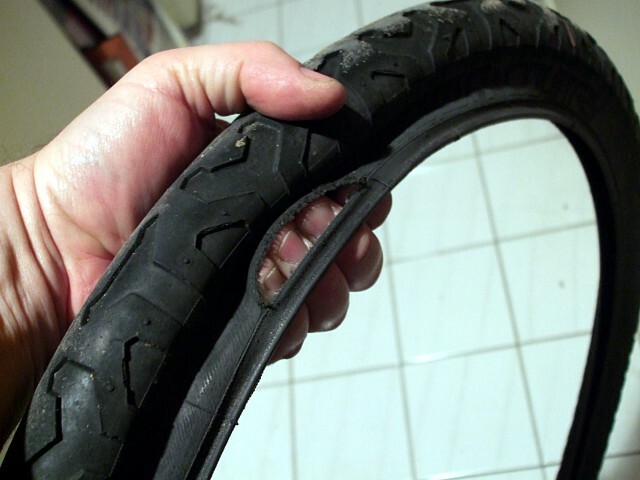 On Monday night, the tube that I’d replaced after Thursday’s flat tire blew out with a bang on the way home. The tire was destroyed, with a 3-inch gash torn in the sidewall just above the bead. In retrospect, the weakened tire had probably already contributed to Thursday’s flat before finally giving out entirely. These were virtually new tires, installed just this past spring and with only about 2500 km on them. A previous set of the same model lasted about 12,000 km before also succumbing to a blowout. By Tuesday, I was paranoid enough to run an important errand by TTC instead of taking my bike. The errand was completed, and the bike survived its other rides that day without incident. 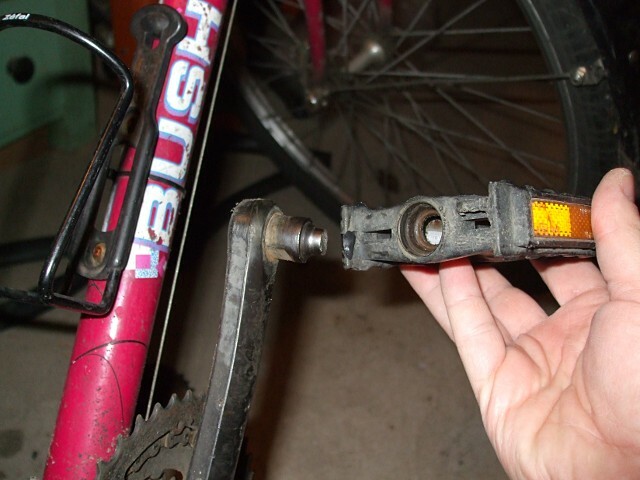 Starting my ride home on Wednesday night, I could tell that something was wrong with my right pedal. I thought that maybe one side of the platform was broken, but I couldn’t see anything in the dark and decided to finish my ride home and check it out in the garage. Unfortunately, I only made it about halfway before the pedal broke off, the spindle cleanly severed where it enters the body of the pedal. I tried to look at the bright side: I’ve destroyed four pedals in the last couple of years, but this is the first time I’ve broken a right pedal. I’ve always broken left pedals before now. Maybe this means that my right leg is getting as pedal-breakingly strong as my left. This Thursday, I countered my run of bad luck by switching bikes and giving my usual commuter a rest. It’s due for a new drivetrain anyway, so here’s hoping that it’ll be happier next week with a whole bunch of new components. This year's cycling mileage: 668 km.